^ Analysis: China seeks new Russian technology Retrieved: 24 November 2007. ^ Grevatt, Jon. Indonesia selects Su-35 to meet air combat requirement. IHS Jane's 360. 2015-09-02 [2015-09-12]. ^ Russia to lend Venezuela $4 bln to pay for arms deals. [24 December 2014]. ^ North Korea asked Russia for Su-35 fighter jet supplies - reports. TASS. 9 January 2015 [20 November 2015]. ^ СМИ узнали о переброске в Сирию новейших российских истребителей Су-35C. РБК. [2016-02-01]. Crosby, Francis. 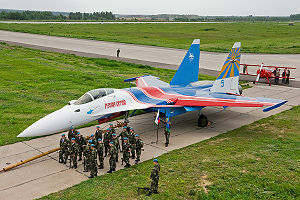 "Sukhoi SU-35." Fighter Aircraft. London: Lorenz Books, 2002. ISBN 0-7548-0990-0. Williams, Mel. "Sukhoi 'Super Flanker' Family." Superfighters: The Next Generation of Combat Aircraft. Norwalk, CT: AIRtime Publishing, 2002. ISBN 1-880588-53-6.